Peptide (C)EDEVAAKEGNSPGPQ, corresponding to amino acid residues 1943-1956 of rat NaV1.8 (Accession Q63554). Intracellular, C-terminus. Homology Mouse - 14/15 amino acid residues identical; human - 7/15 amino acid residues identical. Label ATTO-594. Maximum absorption 601 nm; maximum fluorescence 627 nm. The fluorescence is excited most efficiently in the 580 - 615 nm range. This label is related to the Rhodamine dyes and can be used with filters used to detect Texas Red and Alexa-594. Reconstitution 50 µl double distilled water (DDW). Antibody concentration after reconstitution 1 mg/ml. Storage after reconstitution The reconstituted solution can be stored at 4°C, protected from the light, for up to 1 week. For longer periods, small aliquots should be stored at -20°C. Avoid multiple freezing and thawing. Centrifuge all antibody preparations before use (10000 × g 5 min). Standard quality control of each lot Western blot analysis (unlabeled antibody, #ASC-016), and immunohistochemistry (labeled antibody). Immunohistochemical staining of adult rat dorsal root ganglion (DRG) using Anti-NaV1.8 (SCN10A)-ATTO-594 Antibody (#ASC-016-AR). A. NaV1.8 labeling (red) appears in the cell bodies of the DRG. Note that the nerve fibers are not stained. B. Nuclear staining using DAPI as counter stain. C. Merged image of A and B.
Immunohistochemical staining of rat DRG frozen section using Anti-NaV1.8 (SCN10A)-ATTO-594 Antibody (#ASC-016-AR) and Anti-Synaptophysin Antibody (#ANR-013). A. NaV1.8 staining (red). B. Synaptophysin staining (green). C. Merged image demonstrates a partial overlap in the distribution of NaV1.8 and Synaptophysin within the DRGs. 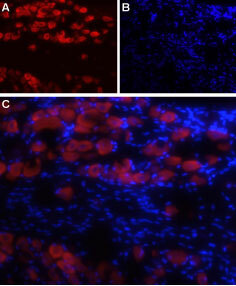 DAPI is used as the counterstain (blue). 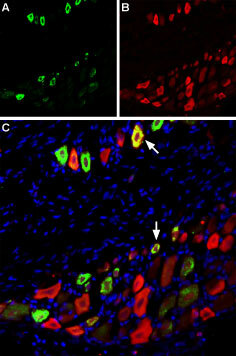 Immunohistochemical staining of rat dorsal root ganglion (DRG) using Anti-Rat TRPV1 (VR1) (extracellular)-ATTO-488 Antibody (#ACC-029-AG), (green), (1:60) and Anti-NaV1.8 (SCN10A)-ATTO-594 Antibody (#ASC-016-AR), (red), (1:60). A. TRPV1 staining. B. NaV1.8 staining. C. Merge of A and B demonstrates partial co-localization of TRPV1 and NaV1.8 channels. Nuclei stained using DAPI as the counterstain (blue). Wu, L. et al. (2002) NeuroReport 13, 2547. Baker, M.D. and Wood, J.N. (2001) Trends Pharmacol. Sci. 22, 27. Lai, J. et al. (2003) Curr. Opin. Neurobiol. 13, 291. Fang, X. et al. (2002) J. Neurosci. 22, 7425. Fjell, J. et al. (2000) NeuroReport 11, 199. Renganathan, M. et al. (2003) Brain Res. 959, 235. Voltage-gated Na+ channels (NaV) are essential for the generation of action potentials and for cell excitability1. NaV channels are activated in response to depolarization and selectively allow flow of Na+ ions. To date, nine NaV α subunits have been cloned and named NaV1.1-1.92,3. The NaV channels are classified into two groups according to their sensitivity to tetrodotoxin (TTX): TTX-sensitive and TTX-resistant channels4,5. Their expression is developmentally regulated and tissue specific. Two TTX-resistant NaV channels are expressed in dorsal root ganglion (DRG) neurons, NaV1.8 and NaV1.9. The NaV1.8 channel (also called SCN10A, SNS and PN3) is mainly expressed in small-diameter DRG neurons4,6. TTX-resistant channels have been suggested to play an important role in nociceptive transmission. Recently, the involvement of NaV1.8 in multiple sclerosis (MS) was suggested due to up-regulation of both mRNA and protein in Purkinje cells of MS patients and also in animal models6. Anti-NaV1.8 (SCN10A) Antibody (#ASC-016) is a highly specific antibody directed against an epitope of the rat protein. The antibody can be used in western blot, immunoprecipitation, immunocytochemistry, and immunohistochemistry applications. It has been designed to recognize NaV1.8 from rat, human, and mouse samples. Anti-NaV1.8 (SCN10A)-ATTO-594 Antibody (#ASC-016-AR) is directly labeled with an ATTO-594 fluorescent dye. ATTO dyes are characterized by strong absorption (high extinction coefficient), high fluorescence quantum yield, and high photo-stability. The ATTO-594 fluorescent label belongs to the class of Rhodamine dyes and can be used with fluorescent equipment typically optimized to detect Texas Red and Alexa-594. Anti-NaV1.8 (SCN10A)-ATTO-594 Antibody is specially suited to experiments requiring simultaneous labeling of different markers. Anti-NaV1.8 (SCN10A) Antibody (#ASC-016), (for western blot analysis). Anti-NaV1.8 (SCN10A) (extracellular) Antibody (#ASC-028). This antibody recognizes a different epitope and thus can also be used as a control for detecting NaV1.8. Guinea pig Anti-NaV1.8 (SCN10A) Antibody (#AGP-029) is raised in guinea pig and can be used in immuno-colocalization studies in conjunction with any of our antibodies raised in rabbit. This antibody has been raised against the same epitope as #ASC-016. Anti-NaV1.8 (SCN10A) (extracellular) Antibody (#ASC-028). 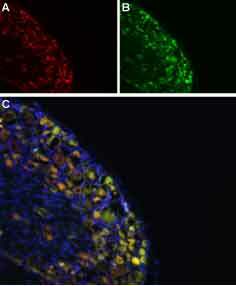 This antibody recognizes an extracellular epitope and can be used to detect NaV1.8 in live cells.